I had the pleasure of interviewing two inspiring individuals for Adventure Journal this winter. Conversations ran from parenthood to adventure, from Antarctica to Afghanistan to the summit of Everest. Development pro Laurie Ashley, co-writer of Ski Afghanistan, shared great advice for living a fulfilling life, and wonderful stories of raising a child in Central Asia. I met Laurie as John and I were cycling through in 2013, and we enjoyed a wonderful ski day outside of Bishkek. Talking with Laurie about her work and life was an amazing opportunity. Four years ago, Montana natives Laurie Ashley and husband Chad Dear spent a season ski touring in Afghanistan, in the Koh-e-Baba Range of the Central Highlands. Based in the town of Bamyan, they trained guides and researched a ski guidebook to the region, supported by the Bamyan Ecotourism Program and the Aga Khan Development Network, and were part of a renaissance of local interest in skiing. From skinning up the flank of Koh-e-Zard’s untouched – and never before skied – flank while jotting notes on a dreamed-of traverse, to working with numerous NGOs all over Central Asia as development and resource management specialists, this pair has been able to combine meaningful work and serious play in some of the world’s least visited mountains. Today, they live in Bishkek, Kyrgyzstan, with their two year old daughter Zoe. We talked with Laurie across thirteen time zones and asked her our 10 questions. 1. You spent time in the late 2000s ski touring in central Afghanistan while assembling a backcountry guidebook to the region. 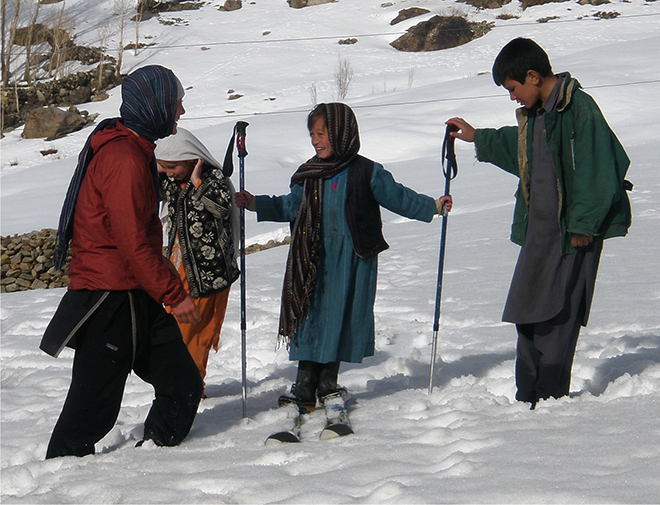 How did you first consider ski tourism in Afghanistan as a project you wanted to pursue? What drew you to Bamyan? There’s quite a backstory there. We were working in East Timor – Timor Leste – near Indonesia and Chad got a job offer in Afghanistan. Our first reaction was: No way, we’re not ready to go to Afghanistan – I was worried about even going to East Timor, because there had been recent dual assassination attempts on the president and prime minister and a little bit of unrest, but Afghanistan was pretty inconceivable as a place to go and live. That was our first reaction. He suggested that in part because the Aga Khan Foundation has a tourism project that they’re trying to expand into four-season tourism, including winter. We moved to Afghanistan in June, initially for Chad’s work doing natural resource management with another NGO. I started doing some consulting and working with Aga Khan and couple other organizations, and when winter came around we started doing more and more skiing and our initial idea started to grow. Then we sort of thought, wow, this would be an incredible opportunity to turn this into a full scale project. So we wrote a proposal to the Aga Khan Foundation, about what we could do for them in terms of expanding their winter tourism program over the next five months. And they accepted it, and thats what we ended up doing. You can read the read of the interview here. Eric Larsen loves extreme cold, and he has made a living out of exploring the least hospitable places on earth. In 2010, he became the first person to reach all three of the planet’s terrestrial poles – the North Pole, South Pole, and Everest – in a single calendar year. 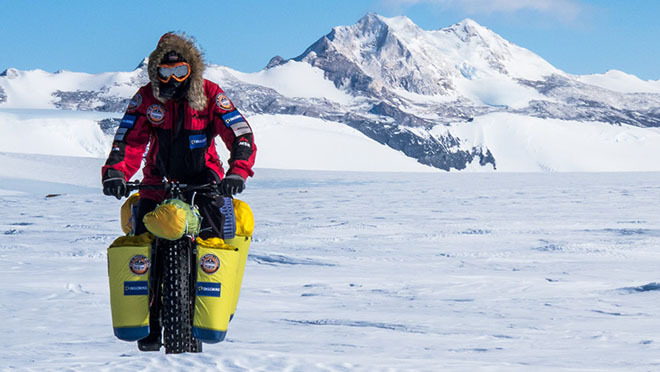 From fatbiking on Antarctica to skijoring Greenland, he is usually found moving quickly under his own power in the frozen parts of the world. 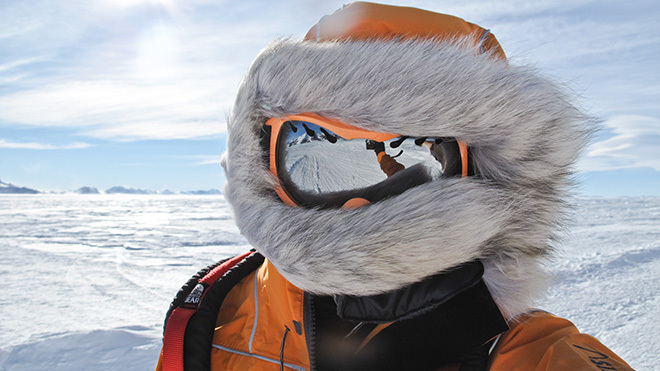 Larsen is in Resolute, Canada, about to step onto the ice for another journey to the North Pole, this time in an attempt to break the speed record for an unsupported journey, 49 days, which was set by a Norwegian team in 2006. We caught up with him first at home in Boulder, Colorado, and then in Resolute as he waited with teammate Ryan Waters for the weather to lift so they could fly to Cape Discovery and step onto the ice. 1. You leave for the North Pole in a week. What does your house look like right now? What is the vibe at home? If I would have answered this question a few hours ago, I would have said complete chaos. I’ve managed to get everything a bit more under control and organized since then. We’ve been ticking off things on the ‘to do’ list while still managing to get out and train as well. The big stress was (and still is) trying to get our sleds shipped to Resolute, where we will stage for 6 days before leaving for Cape Discovery. The latest snafu is having to haul the sleds to FedEx Cargo versus simply dropping them off at the main station in Boulder, CO. We’ve put a lot of effort into making sure the sleds are well prepped and will make it north and we don’t have a lot of extra time for delays so each missed step is a bit frustrating. The home vibe is a lot of things. Getting ready to leave for two months is never an easy thing to do on a lot of levels. Most days up late and up early. Additionally, I’m trying to focus on family time with Merritt and Maria. Fast forward one week: I’m now in Resolute and the pace has slowed a bit but the work has not. We have just spent the last three days working on gear and sorting food. We hope to fly out at the end of the week but the weather is not really looking that good.